1919. Nation, State, and Economy. 1929. A Critique of Interventionism. 1941. Interventionism: An Economic Analysis. 1944. Omnipotent Government: The Rise of the Total State and Total War. 1947. Observations on the Cooperative Movement. 1952. Planning for Freedom, and Other Essays and Addresses. 1969. The Historical Setting of the Austrian School of Economics. 1978. On the Manipulation of Money and Credit. 1978. The Clash of Group Interests and Other Essays. 1979. Economics Policy: Thoughts for Today and Tomorrow. 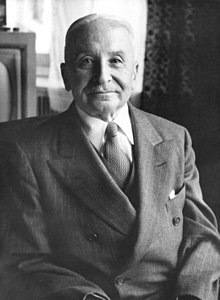 ^ Who was Ludwig von Mises?. Ludwig von Mises Institute web site. [2006-04-08]. ^ Hulsmann, Jörg Guido. Mises: The Last Knight of Liberalism. Ludwig von Mises Institute. 2007: 3–9. ISBN 193355018X. ^ Von Mises, Ludwig; Goddard, Arthur. Liberalism: a socio-economic exposition 2. 1979. ISBN 0836251067. ^ Mises, Ludwig von, The Historical Setting of the Austrian School of Economics, Arlington Houise, 1969, reprinted by the Ludwig von Mises Institute, 1984, p. 10, Rothbard, Murray, The Essential Ludwig von Mises, 2nd printing, Ludwig von Mises Institute, 1983, p. 30. ^ The Free Market: Meaning of the Mises Papers, The. Mises.org. [2009-11-26]. ^ Mises, Margit von, My Years with Ludwig von Mises, Arlington House, 1976, 2nd enlarged edit., Center for Future Education, 1984. ^ Mises, Margit von, My Years with Ludwig von Mises, Arlington House, 1976, 2nd enlarged edit., Center for Future Education, 1984, pp. 219-220. ^ Rothbard, Murray, Ludwig von Mises: Scholar, Creator, Hero, the Ludwig von Mises Institute, 1988, p. 68. ^ Hulsmann, Jorg Guido. Mises: The Last Knight of Liberalism. Ludwig von Mises Institute. 2007: xi. ISBN 193355018X. ^ Coudenhove-Kalergi, Richard Nikolaus, Graf von. An idea conquers the world. London: Hutchinson. 1953: 247. ^ Doherty, Brian, "Radicals for Capitalism", PublicAffairs, 2007, p.10. ^ On Mises' influence, see Rothbard, Murray, The Essential Ludwig von Mises, 2nd printing, the Ludwig von Mises Institute, 1983; on Eastman's conversion "from Marx to Mises," see Diggins, John P., Up From Communism Harper & Row, 1975, pp. 201-233; on Mises's students and seminar attendees, see Mises, Margit von, My Years with Ludwig von Mises, Arlington House, 1976, 2nd enlarged edit., Center for Future Education, 1984. ^ Reisman, George, Capitalism: a Treatise on Economics, "Introduction," Jameson Books, 1996; and Mises, Margit von, My Years with Ludwig von Mises, 2nd enlarged edit., Center for Future Education, 1984, pp. 136-137. ^ Rothbard, Murray, Ludwig von Mises: Scholar, Creator, Hero, the Ludwig von Mises Institute, 1988, p.61. ^ Socialism: An Economic and Sociological Analysis by Ludwig von Mises. ^ F. A. Hayek, (1935) who also wrote the introduction to "Socialism" and went on to author "The Nature and History of the Problem" and "The Present State of the Debate," in F. A. Hayek, ed. Collectivist Economic Planning, pp. 1-40, 201-43. ^ Reason.com, "The Man Who Told the Truth" Reason, 1990. Retrieved on April 4, 2009. ^ Best of Both Worlds (Interview with Milton Friedman). Reason. June 1995.